These customized 2.5x 2 blood drop shape full color health insurance magnet – 20 MIL is great for promoting local blood donation drives. You can get this magnet customized with your logo, contact information or any influencing slogan prior to gifting. These magnetic tokens make an ideal choice for healthcare marketers of all sizes. It can be handed out during medical camps, while leaving clinics, during regular medical purchases or in any other way. Along with valuable price savings, you can grab lot of other advantages, too. 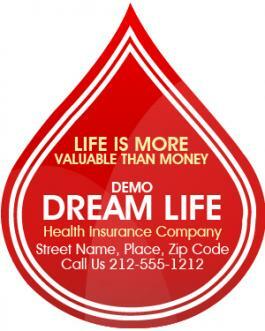 Request a quote to know wholesale price savings for these custom 2.5x 2 blood drop shape full color health insurance magnet – 20 MIL. Imprint Methods: Four Color Process, Full Color Process & Silkscreen. Imprint colors - Black, Brown, Burgundy, dark blue-navy, Dark Green, Gray, Green, Light Blue, Medium Blue, Medium Pink, Orange, Pink, Purple, Red, tan, Teal, Yellow. Product Size : 2.5 in. x 2 in.